A Mega-Anchor is an ideal footing or foundation system that can be used for building certain types of decks, patios and outdoor rooms. The Mega-Anchor foundations system is a cost effective, fully certified footings system that can achieve a live load of 3 KPa (for residential deck construction) or 5KPa (for commercial boardwalk construction). on canal decks, where the decking is in close proximity to revetment walls (say on a canal front), as the Mega-Anchor foundations will not place any load on the revetment wall. 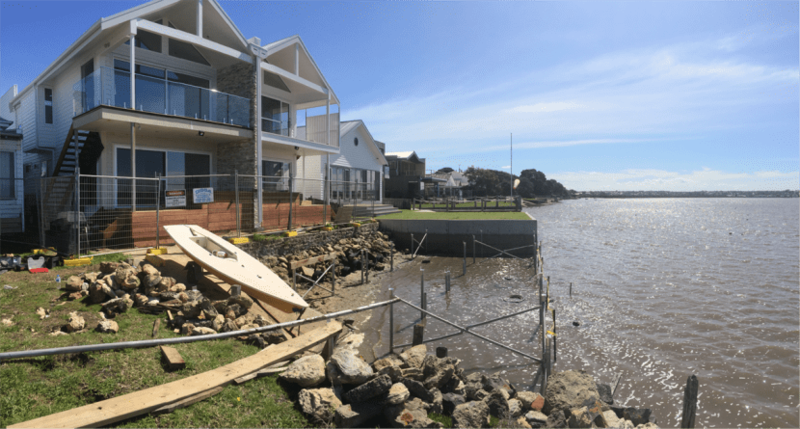 Designer Decks have successfully used Mega Anchor footings as deck foundations in many Gold Coast places including Cova Hope Island, Sanctuary Cove, Coomera Waters and Broadbeach Waters. Can Mega Anchor Footings Be Used In Commercial Boardwalks? Yes, a Mega-anchor footing can also be used as viable footings and foundations for commercial boardwalk construction. In 2015/16, Designer Decks used the Mega-Anchor footings to build a large commercial boardwalk for the Sunshine Coast Council at Bli Bli, Maroochydore, as this was a cost effective foundation solution in a sensitive marine/mangrove environment. Designer Decks service Brisbane, Ipswich, Logan, Redlands, Gold Coast and Tweed areas.